Atlantico Table (msatlanticotable1) at Pure Design / Tables and Desks / Dining Tables ::: Furniture for the Home, Office, Home Office, and More at Pure Design Online! This simply elegant table creates the perfect setting for 6. 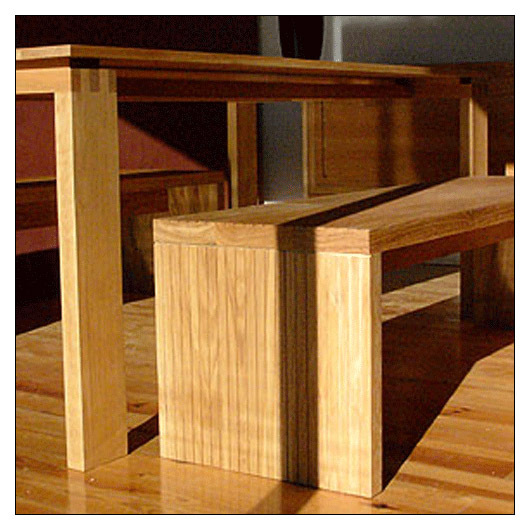 An expansive plane of timber rises above two rectilinear legs. A great match for the Atlantico Bench or Stool. The Atlantico collection is a new brand from the people behind De La Espada. This collection focuses on beautiful hardwood, elegant joinery and natural finishes. Small table measures W60" D35.5" H29.50"; Large table measures W72.75" D35.50" H29.50"
This item is made to order, and can not be returned after production has started. Lower-48 US sales only. Please allow up to 7-14 weeks, or inquire within.